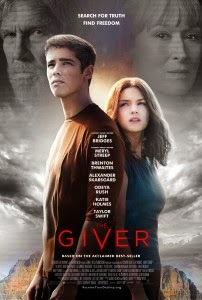 The Giver is based on the Lois Lowry book of the same name. Although I haven't read the book myself, a friend who saw the movie with me said The Giver follows the book pretty well. Both of us quite enjoyed it. The Giver follows a boy turning 18 named Jonas (Brenton Thwaites) and his two friends, Fiona (Odeya Rush) and Asher (Cameron Monaghan). The movie is set in a futuristic world from today where everything is perfect and there are no flaws. Things like race, color, feelings, and choice are erased. At the age of 18, young adults graduate and are assigned a specific job for the rest of their lives. Jonas Job is unlike any of his other classmates and has to learn past memories from The Giver (Jeff Bridges). Jonas soon realizes that the world he lives in is just an act. He discovers feelings such as pain, suffering, sadness, happiness and love. When Jonas tries to share these things and other old memories — like a sled going down a snow-capped mountain and dancing— the Chief Elder (Meryl Streep) notices what he's doing and takes action to stop the sharing of emotions. Things go awry and Jonas can't take the lies anymore. Together, Jonas and The Giver come up with a plan to share what they've learned with the community and the adventure begins. Even though Fiona and Asher don't really know what's going on, they support and help Jonas with his plan. Everything is at stake and the only way to release those memories to everybody is for Jonas to travel down a long tough path. All in all, The Giver was another great book adaptation that offers something for everyone.